The solicitation from the CEC was designed to provide funding for the development of commercial-scale, California-based biofuels production facilities that can sustainably produce at least 15 MMgy of low carbon transportation fuels. On Dec. 19 the Argentine government announced it has submitted a formal complaint to the World Trade Organization against the definitive antidumping tariffs (24.6 percent) imposed by the European Union on biodiesel exports from Argentina to the EU. U.S. EPA has finally issued a Notice of Violation to Imperial Petroleum and its wholly owned subsidiary e-Biofuels for generating more than 33.5 million invalid D4 renewable identification number credits under the renewable fuel standard program. For the third time in five years, Congress is jeopardizing continued growth and job creation in the U.S. biodiesel industry by allowing a key tax incentive to lapse at year's end, biodiesel representatives said in a letter to Congressional leaders. JOil Pte. Ltd., a scientific bioenergy crop developer of a new generation of jatropha, has achieved an average seed yield of 3.53 metric tons per hectare in the third year of its large-scale India field trials. Unpruned, the yield will be 4.42 t/h. U.S. Senate Finance Committee Chairman Max Baucus, D-Mont., has released a discussion draft of legislation that aims to overhaul U.S. energy tax incentives. His office says the incentives are designed to be more predictable and technology neutral. 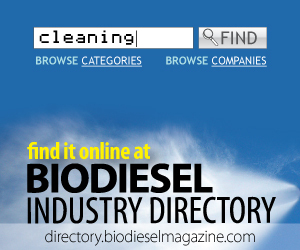 Fifty-four members of Congress representing 24 states called on the Obama administration to boost its proposal for biodiesel production under the renewable fuel standard next year. EPA has proposed stalling the biodiesel RFS at 1.28 billion gallons. BBI International announced this week the agenda for the technical sessions of the 7th annual International Biomass Conference & Expo, North America's largest and fastest growing biomass conference, taking place March 24-26 in Orlando, Fla.